As of late I have been breaking bread and communing with the evangelical Christian singles. Although I am not of that particular ilk of religious veneration of conviction, for I consider myself a zealot and a humble elitist when it comes to being a perpetual student with an ecclesiastical predisposition. The phenomenon of speaking in tongues is embraced as a badge of higher spiritual attainment, both in private and in outlandish public displays of very enthusiastic non interpretative rhetoric in a babble of blather, that is euphemistically liken unto the “Gobbledygook” of the mad hatter. For the record I do believe in the spiritual gifts of tongues as long is there someone there to interpret thereof, a language of the heart that that can be readily conveyed and readily to depart, otherwise all there is a void filled with a fervent incomprehensible noise that lays no claim to the wisdom of understandings impeccable frame. There is a rub, as there always was; the unintelligible resonant voice is tantamount to chanting, liken unto what the Buddhists do, thus creating a spiritual high in the form of an altered state of consciousness, Alpha!, even Beta I Theta. Contemplative prayer is meditating on the word of God. When Reading the Bible especially the King James Version, because it is in Middle English with its unfamiliar vernacular thus requiring the mind to slow down changing its state in and through a thoughtful contemplation. the problem with discipline is that it takes motivation, the problem with motivation is that, not now becomes manana . In recovery we are asked, lo, implored to keep it simple, simple but not stupid. 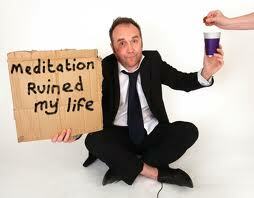 I suggest to my new sponsees that prayer and meditation is an essential part of the recovery process. If we are both on the same page as far as flavor of spiritual or religious conviction it makes it easier, if not I suggest for them to pray to whom it may concern. I suggest getting down on ones knees, if this isn’t familiar or regular habit, start by putting your shoes under your bed, so now you are already down on your knees (Being on your knees is a sign of respect and humility to God, versus being forced to your knees from the humiliation of the alcohol disease) In the morning ask for help and at night a simple thank you for another day and another night clean and sober, free from alcohol’s blight) You have just now spoken to God, to complete the conversation a listening time is required, stay on your knees and remain in the quite for twice as long as you prayed, stay in the feeling and stay in the moment neither thinking or trying how not to think, just be, it might a little uncomfortable at first being alone with your thoughts until you realize you are not alone, you are beginning a relationship, one on One with the creator of the universe, how cool is that? To make a long story endless I would tell you a firsthand account of David E. . .
My meditation practice has focused on using “following the breath to stay in the present moment,” gently silently saying “no thank you” to thoughts from the past or worries of the future. Listening. And when the mind wanders (because that’s what the mind does), I gently bring it back to the present moment breath. Each time I bring it back, I improve my focus. Then I use my focus for my Purpose: to become more useful to God every day, to please God and bring Him glory.